A content resource (workbooks and data sources) can live in only project. Server and site administrators can add or remove top-level projects on a site, and move published content from one project to another. Project leaders with appropriate site roles can add or remove child projects and move content between projects on which they have Project Leader access. To learn about projects and when or why to use them, see Use Projects to Manage Content Access. Before you create project hierarchies, become familiar with Permissions in Project Hierarchies. To see the specific site roles that allow full Project Leader access, see Project-level administration. Select Create > Project to create a new top-level project (only administrators can do this). Navigate to and open the project in which you want to create a sub-project, and then select Create > Project. If you’re not sure where to find a child project, display filters, and select Show all projects. Enter a name and description for the project, and then click Create. 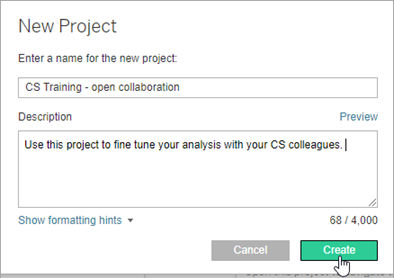 You can include formatting and hyperlinks in the project description. Select Show formatting hints for syntax. You can also Add a Project Image. Note: To edit a project description later, select it to open it, select the information icon next to its name, and then click Edit. On the Content tab, find the content resource you want to move. 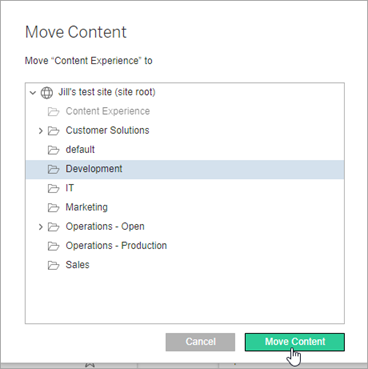 For other content types, you can navigate through its project hierarchy, or by selecting the content type on the Explore menu. On the workbook’s Actions(…) menu, select Move. Select the new project for the workbook, and then click Move Content. Moving a project includes moving everything in it, including child projects and their content. When you move a project, Project Leader permissions adapt to the new project environment. When the target project hierarchy is locked, previous Project Leader permissions are removed, and new Project Leader permissions are granted according to those set at the top-level of the target hierarchy. When the target project hierarchy is unlocked (managed by owner), previous implicitly granted Project Leader permissions are removed, explicitly set Project Leader permissions are retained, and new Project Leader permissions are granted according to those set at the top-level of the target hierarchy. When you delete a project, all of the workbooks and data sources in the project are also deleted from the site. If you want to delete a project but not its content, move the content to another project, and then delete the project. You cannot undo deleting a project. Deleting a project deletes all content in it, including child projects and their content. You cannot delete the Default project. On the Content tab, find the project you want to remove. On the project’s Actions (…) menu, select Delete. Confirm that you want to delete the project. Moving content is effectively like removing it from one project and publishing it to another. For non-administrators, the permissions needed on the source project are different than those needed on the destination project. Note: The term permissions role refers to the collection of related capabilities you can assign as a set. Users with a Server Administrator or Site Administrator site role do not need any additional capabilities. Non-administrators must have the Publisher or higher permissions role set on the project that is the move destination. Ownership of the project or the Project Leader or Publisher permissions role. In a project hierarchy, project owner of, or Project Leader permissions role on the project or a parent project higher in the hierarchy. Workbooks: Workbook owner or Move capability set explicitly on the workbook. You can grant the Move capability individually, or along with related capabilities allowed through the Editor permissions role.